Collapsed arches: The arch of your foot is arguably the most important structure of your foot. It bears the brunt of the impact when running. Arches can collapse without proper support. Toenail loss or bruising: If there is not enough space in the toe box of the shoe, the increased pressure on the toes will resulting in blackening and subsequent loss of the nail. Blisters: The development of blisters is one of the most common complaints among runners. They can occur due to the shoe rubbing the wrong way on your skin when running or an improper shoe and socks combination. 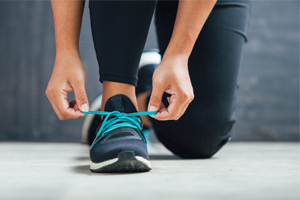 Plantar fasciitis: The result of repeat pounding on your feet while wearing shoes that do not provide proper cushioning can result in intense heel pain due to inflammation of the plantar fascia, which is the fibrous tissue that connects the heel bone to the toes. Nerve irritation: Continuous pressure on certain parts of the foot from a shoe that is too tight can result in nerve damage and altered sensations, such as a feeling of heat or burning in your toes. Stress fractures: Tiny bone breaks may occur in the foot when running on hard surfaces and shoes that do not have enough cushion to absorb the impact while running. Tendonitis: Inflammation of the foot tendons may occur with outward rolling (supination) or inward rolling (pronation) of the foot. Choosing the best pair of shoes for you will depend on the biomechanics of your running style. Check the wear pattern on your shoes. If you see wear mostly on the ball of your foot and some at the heel, you likely have a neutral strike, also known as basic pronation. Wear concentrated along the inside of the shoe is characteristic of over pronation. Supination is very uncommon and is characterized by increased wear on the outer edge of the shoe. Cushioning shoes are designed to greatly enhance shock absorption for runners experiencing basic pronation and supination. Stability shoes can be a good option for runners experiencing moderate pronation or those wanting more arch support. They have denser foam on the inside heel to help reduce pronation. Runners experiencing moderate-to-severe over pronation should chose a motion control shoe. These shoes have special internal construction designed to counter over pronation, which may include stiff heels and progressively denser foam. Outside of traditional running shoes, several other running styles have gained popularity and offer new ways to enjoy a run. Minimalist shoes are designed with less cushion and a lower drop than traditional shoes to encourage a more natural stride and a mid-foot or forefoot strike. Some runners find this style reduces impact on joints and builds stabilizing muscles. Once you have selected the type of shoe you want, it is important to get the right fit. A good fit should be snug everywhere and tight nowhere. It keeps your toes from hitting the front of your shoes and keeps your heels from lifting and blistering. North Central Surgical Center is the premier surgical hospital in Dallas, TX. Our mission is to care for every patient and their family as if they were our own.